On An Overgrown Path: What price a classical radio presenter? What price a classical radio presenter? New York Magazine's 'What Do You Get Just for Showing Up? An appearance-fee pecking order' can usefully be extended to classical music. A noticeable appearance-fee beneficiary is the BBC's self-styled 'Prom Queen' and 'Maestro' star Katie Derham whose recent Tweets include "Sofya Gulyuk tickling ivories v effectively right now on @bbcradio3 Rach 3. Beautiful". 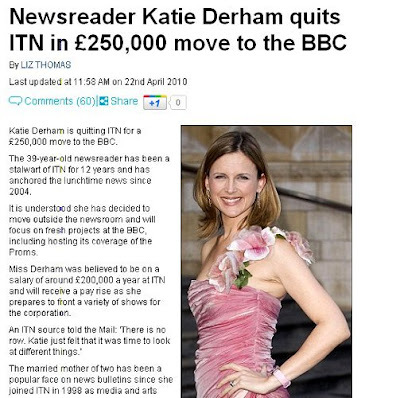 In addition to a reported salary of £250,000 Ms Derham will just show up for corporate and public sector clients for a fee of "£5k - £10k" per appearance. Katie Derham is positioned as the BBC's 'face of the Proms' and the BBC Proms are subsidised by the public via the TV license fee to the tune of around £75,000 for each concert. Others benefit from appearance-fees more clandestinely, but it's all part of classical music's celebrity economy.